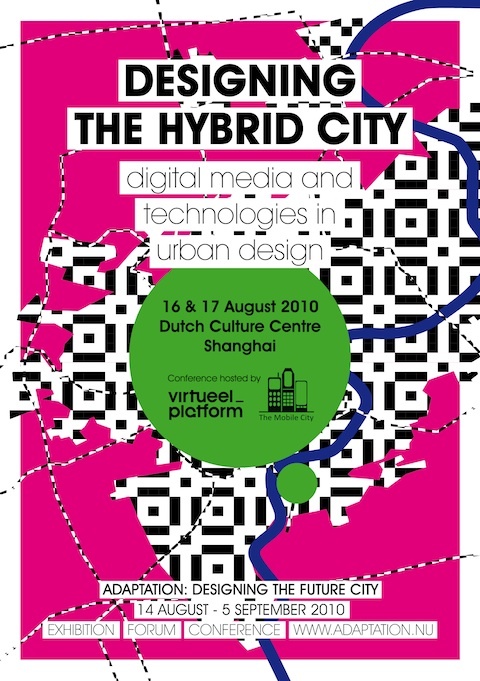 On August 16-17 2010 The Mobile City and Virtueel Platform organized ‘Designing the Hybrid City’. This event explored the role of digital technologies in urban design. It took place in the Dutch Culture Centre in Shanghai. Our event was part of a cluster of events called Adaptation: Designing the Future City that took place August 14-17 in the context of the World Expo 2010 in Shanghai. Main theme: how do digital technologies alter urban culture and change urban design? Mobile and wireless technologies increasingly shape our urban environment and turn our cities into ‘hybrid cities’. What does this mean for urban design? How should we deal with this emerging relation between digital technologies and the city? Which approaches have already proven successful? Which experiments have the most promise? What can different disciplines involved in urban technology and interface design learn from each other? And how is the process of urban design itself changing? See MainTheme for information about the program. See Program Overview for more details about the 6 themes. We plan to publish video recordings of some of our lectures and reports about the conference in the near future on this website.